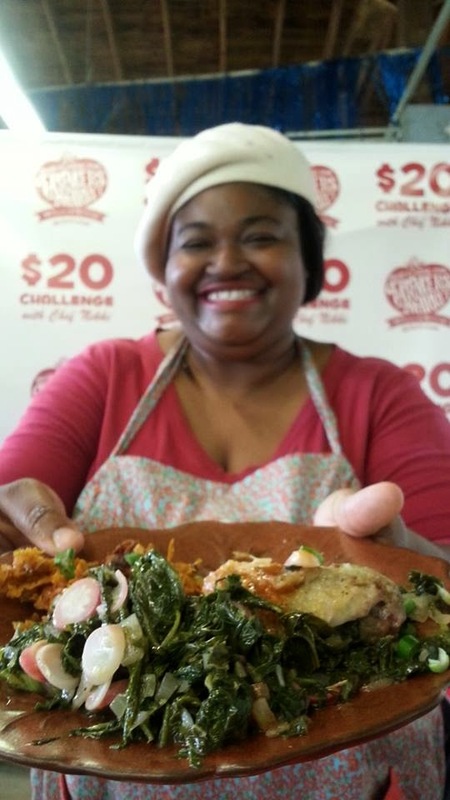 To prove that you can eat locally grown food AND stay within your grocery budget, the Dixie Classic Fair Farmers Market and the City of Winston-Salem is sponsoring the $20 Challenge twice a month from May through September in 2014. I will stage a live cooking demonstration in which I will attempt to prepare a meal for a family of four for $20 using ingredients I buy at the market that day. To watch the Winston-Salem Farmers Market commercial (you might see someone you know), click here. Juicy, tender chicken thighs and drumsticks with a golden-crisp skin are very simple and can be achieved with a little oil and a little patience. Adding cornstarch to your seasoned flour will make the crust of the chicken extra crispy. The hardest part of this recipe is waiting while they slowly cook on the stove-top. You want the skin to be golden-brown with all the fat rendered before you turn them over. This chicken is completely worth the wait! Season the chicken thighs generously with salt and pepper. Combine the flour, cornstarch, additional salt and pepper in a large bowl and stir to distribute. Dredge each thigh and leg in the flour mixture. Heat the oil in a large skillet over medium-high heat. When the oil is very hot (just before smoking), lay the chicken pieces in, skin side down. Without moving them, cook uncovered for about 20-25 minutes. Let them cook until the fat has rendered and the skin is deep golden brown and crisp; this could take as long as 30 minutes. When they are uniformly browned, drain the oil from the skillet (keeping the chicken pieces in the skillet), and put the skillet on the cooling eye of the stove while you finish the side dishes. Spring greens are easy to prepare for cooking by simply rinsing them thoroughly under cool water to remove sand or grit hiding in the folds of the leaves. When the leaves are clean, imply pinch off the tough stems and they'll be ready to cook! Heat olive oil in medium-sized pot over medium heat. Add diced onion, and saute until tender and fragrant. Add the washed and cleaned radish green tops, kale and turnip greens. Mix together and cook for about 3 minutes to coat the greens with the oil and onion. Add white wine vinegar. Cook until the greens have wilted down and released water, about additional 3 minutes. Add salt and pepper to taste. In a small bowl, toss sliced radishes with salt and pepper. Add to the wilted greens and cook until the liquid has all but evaporated. Add the butter, stir and serve immediately. Garnish with green onions. Put oil in a small pot over medium-high heat. Toss sweet potatoes with the all-purpose flour and season with salt and pepper. When olive oil is hot, add sweet potatoes and sprinkle with additional salt and pepper. Cook, stirring occasionally, until they change color and begin to brown, then stir occasionally until they are tender, yet crisp. Use tongs or serving fork to remove potatoes. Drain on paper towels. Serve alongside mixed greens and fried chicken thighs and drumsticks. Come see how I do it and get some great ideas for feeding your family. Want to stage your own $20 Challenge? What a great challenge - opens your eyes to all the possibilities. Delish recipe! I love this challenge. It really is possible to eat well (and locally) on a budget as long as you are creative. This dish looks and sounds awesome! This recipe looks delicious! And the challenge is awesome - I could really use some budget chicken recipes! Everything looks awesome! Such a great challenge, too. Love it! Well how cool is that! I can't believe that I've heard nothing about the challenge before now. I'm going to try and get over there to see you one of these weeks! This is a great challenge and a wonderful way to show the community that it isn't expensive to eat healthy!